There are a wide variety of art activities for the creative teenager. Teens are well equipped to understand complex art concepts, yet still enjoy simple projects requiring an active imagination. Capture the spirit of artistry by inspiring personal expression through art. Batik is a method of dyeing fabrics using the wax-resist method. This ancient tradition has roots in Indonesian culture. 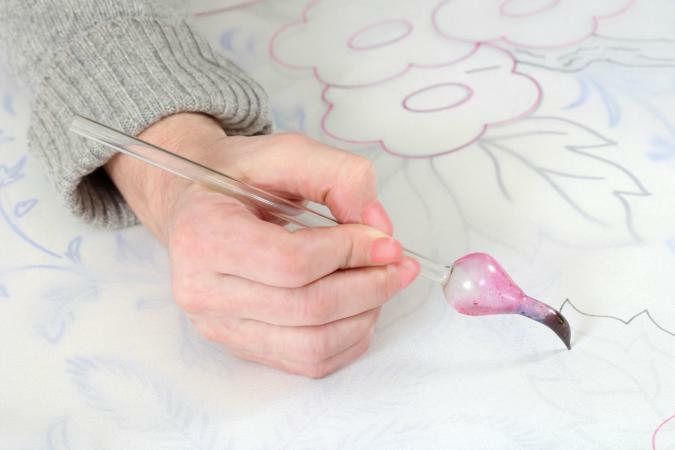 The artist uses wax to create a pattern on fabric before dyeing. The areas where the wax is applied will resist the fabric dye, and the process can be repeated several times with different colors of dye. The intricate nature of this process means it will take more than one day to complete a project and requires careful planning. Pre-wash and dry fabric according to manufacturer directions. Using pencil and paper, draw out design ideas. Be sure to avoid using tiny details and thin lines as they will be difficult to execute. Once the student chooses a design, have her decide on the color palette. Batik often features layers of colors and takes careful planning to ensure the final product is successful. Mark the pattern lightly in pencil on the bag. Heat wax according to package directions. Stretch and secure bag onto frame or piece of cardboard to help keep it taut and straight. 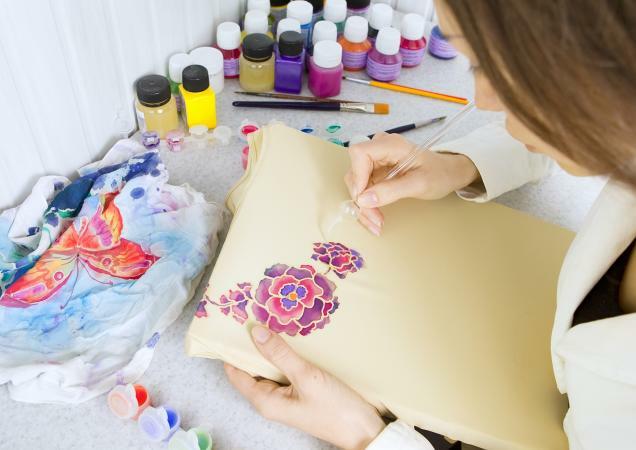 Apply wax over pencil markings on the bag using appropriate tools to create the chosen design. Check to be sure wax is penetrating fabric before allowing to dry. Dye fabric according to package directions and allow to dry completely. For best results, apply the dye in colors from lightest to darkest. You can also paint the dye onto the fabric rather than dip-dying. To add additional colors, repeat steps four to nine. After you have allowed time for the dye to try, submerge the cloth in a pot of simmering water with a little detergent in it. The wax will come off the cloth and float to the top. The finished product can be kept for personal use as wearable art, sold as a fundraiser item, or donated to a local nonprofit such as a public library or food pantry. Batik designs are unique because they incorporate individual creativity, but also because the waxing and dyeing processes are not precise. Throughout history and across cultures, animals have served as symbols for many things. Artists should choose an animal that represents aspects of their personalities for this project. Because of the use of clay, this project will take more than one day to complete. Use the modeling clay to experiment with creating a three-dimensional animal shape. The cutting tools can then be used to create holes for light to escape. Be sure to leave an opening large enough to fit a tea light candle through. Once the model design has been successful, it is time to recreate the piece using the air drying clay. This clay will dry harder than the modeling clay and be more sturdy for a lasting project. Mold the shape of the chosen animal, ensuring it is hollow and 3-dimensional. Use the cutting tools to create the candle opening and holes where the light will shine through. Allow the lantern to dry completely (or use kiln) before inserting a tea light candle. LED candles are perfect for projects like this. Throughout history, different cultures have found ways to use natural materials to build structures. This project challenges artists to utilize materials such as rocks and mud to create a miniature building that is structurally sound. Fairy houses and structures make great examples of natural architecture and building. Create a pencil drawing of the intended structure. Select natural materials to use, including a binding material to hold the structure together. Use molds to create structural items, such as bricks, if desired. Build the chosen structure upon the piece of cardboard using only natural materials. Allow your completed fairy house completely. It may be necessary to repeat the fourth and fifth step for more intricate details. If you want, you can decorate the base to mimic the landscape where you might find the chosen materials. This project can be done on an individual basis or with a group effort in mind. Each artist could be responsible for one type of structure that is found in a village or city to create a complete scene when finished. The beautiful, intricate artistry of stained glass windows typically tell a story of some kind. This simple activity challenges artists to create a one-scene story translated through composition and color. 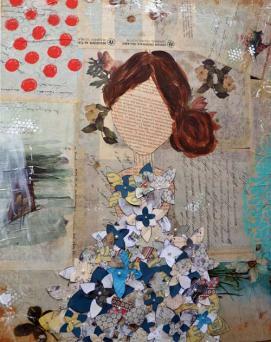 While the materials may seem juvenile, the challenge is in developing a story and incorporating details by layering colors. Brainstorm, then draw out a story that can be told in one scene using multiple colors. Cut a piece of wax paper to the desired size and shape. Lay flat on work surface. 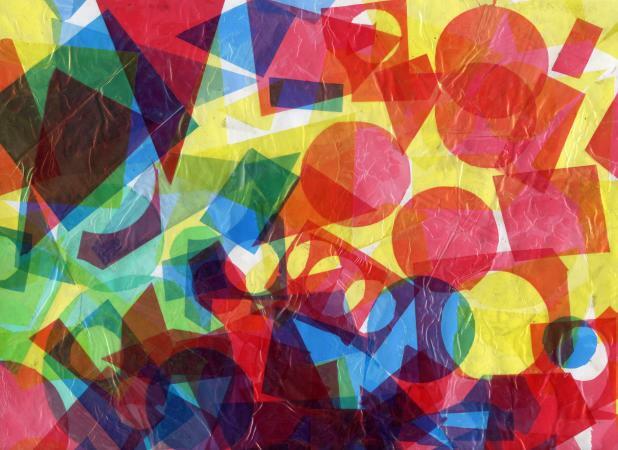 Cut tissue paper into geometric shapes. Lay out the chosen design onto the wax paper. Consider how layering different colors can create a new color and layering the same color can increase its intensity. Finalize the design and take note of the order for laying each layer. Paint a light layer of liquid starch onto the wax paper. Place the first layer of tissue paper onto the starched paper. Repeat steps five and six until all layers have been placed. Paint a final layer of starch over the tissue paper. Allow the art to dry completely before displaying in a window. Those with access to more supplies and bigger budgets could create actual stained glass pieces using real glass and copper foil or lead. Artists are challenged to create a self-portrait that doesn't include any figures representing the human form. The most challenging part of this project is imagining objects, numbers, colors and other abstract designs as representative of more concrete personality traits and people. Choose a famous person from the past or present. Research quotes from this individual and select two that represent the person's personality. Use these quotes to conceptualize a self-portrait of the person that does not include any part of the human form. You can include objects, shapes, numbers, animals and landscapes. Use colored pencils and paper to draw out ideas. Choose a final design. Apply acrylic paints to the canvas, creating the image you chose in the second step. Allow to dry and display with the quotes under the painting. For added fun, challenge others to guess who inspired the portrait. What makes each artist unique is her perspective. While an artist has a view of the world, exploring alternative ways to process the world around you can be invaluable. This activity requires a look at the world from an unexpected viewpoint. Choose an object, location, or person to use as inspiration. Consider the standard view of this inspiration, then choose another element and how its perspective might be different from the norm. For example, looking at a flower from the human perspective provides one picture while looking at it from the perspective of the dirt provides a different image. Decide upon an unexpected perspective and inspirational image. Using watercolors, create a picture on the paper. The nature of watercolors will create a fantasy-like texture to bring out the interesting point of view. Many artists are known for their use of unconventional materials in creating stunning works of art. The use of materials not typically considered as art supplies can challenge an artist to explore both creativity and perspective. Choose a common object made from more than one material. It could be as simple as a soup can or as complex as a car. Examine the materials used to make up the chosen object. For example, a soup can is made from metal, paper, and ink. Look for unconventional materials with the same makeup as the chosen object. In the soup can example unconventional materials might include paper clips (metal), wood pulp (paper), and blueberry juice (ink). Decide whether to create a sculpture or 3-dimensional piece of wall art. Use the unconventional materials to recreate the original object chosen. In this example, an artist could sculpt a soup can shape out of paper clips held together by wood pulp with the word 'soup' written on the pulp in blueberry juice. The use of common materials in a unique way is a current trend in popular art. Examples can be seen everywhere from galleries to television cartoons and children's books. One of the most common and expected art supplies is paper. This activity focuses on the creativity of each artist to create a unique piece using the same, standard materials. Leaf through a variety of papers, taking note of texture, pattern, and coloration. Choose a few materials to use. Using the paper materials as inspiration, brainstorm an illustration of a single scene that could appear in a book. For examples, students could use a favorite children's book or illustrated novel as inspiration. Manipulate the paper pieces and layer to create a template for the illustration. Lay the piece of thick weight paper on work surface and paint a layer of white glue. Apply paper pieces to the glue. Paint more white glue on top of this paper before adding the next layer. Once the glue has dried use markers or pens to draw in any additional elements needed to complete the illustration. Art activities are as unique as the person creating them. Whether using standard techniques and materials or unexpected supplies, encouraging creativity and personal expression are key.